Coming from a broad range of philanthropic interests, funders are continuing to integrate placemaking efforts with innovative grantmaking programs. On a recent morning in mid-October, a group of 32 representatives from diverse organizations across the United States and Canada gathered in Brooklyn, New York, for a day-long discussion on the intersections between placemaking and philanthropy. The event was held in conjunction with a Grassroots Grantmakers "On The Ground" event. ArtPlace America (ArtPlace) is a ten-year collaboration among a number of foundations, federal agencies, and financial institutions that works to position arts and culture as a core sector of comprehensive community planning and development in order to help strengthen the social, physical, and economic fabric of communities. In practice, this means having arts and culture represented alongside sectors like housing and transportation – with each sector recognized as part of any healthy community; as requiring planning and investment from its community; and as having a responsibility to contribute to its community’s overall future. Cities for People is a new initiative of the J.W. McConnell Family Foundation, which has grown in part from a recognition that in cities here and around the world, there is a deep yearning for change. The core proposition is that cities can be made more resilient and livable through innovation networks. By linking local efforts across the country with those taking place in other parts of the world, they want to foster a culture of continuous social innovation and deeper collaboration. What is your best idea to make cities more successful? The Knight Cities Challenge seeks new ideas from innovators who will take hold of the future of our cities. Applicants simply must submit ideas for making the 26 Knight communities more vibrant places to live and work at the city, neighborhood and block levels, and all sizes in between. By simplifying the lengthy traditional funding process, Knight is making sure that everyone has an opportunity to share an idea for their city. The Southwest Airlines Heart of the Community program was developed to support and activate public spaces in the heart of cities. Launched in April 2014, the program aims to support Placemaking – a movement that reimagines public spaces as the heart of every community. Through a multi-year partnership with PPS, Southwest Airlines is committed to leveraging the power of Placemaking to strengthen connections between people and the places they share and to spark social, economic, and environmental benefits in communities across the country. Levitt is passionate about reinvigorating America’s public spaces through creative placemaking and creating opportunities for everyone to experience the performing arts. They believe the world needs more third places, guiding their community-driven efforts. By sponsoring dozens of concerts in 16 communities around the country, they use music to create gathering spots and bring people together. Levitt Pavilions offers grants, resources and support to build and sustain signature Levitt music venues and to present the Levitt AMP series. Program: Placemaking Micro-Grants Innovation: Small grants through local REALTOR® associations. NAR’s Placemaking Initiative encourages REALTOR® associations and their members, to engage in Placemaking in their communities. The Placemaking Micro-Grant is available to REALTOR® associations to help them plan, organize, implement and maintain Lighter, Quicker, Cheaper Placemaking activities in their communities. REALTORS® are uniquely positioned to help communities build better public spaces, with their vested interest in making sure people can purchase homes in areas with a strong sense of place. ioby helps neighbors grow and implement great ideas one block at a time. Their crowd-resourcing platform connects leaders with funding and support to make our neighborhoods safer, greener, more livable and more fun. ioby believes that it should be easy to make meaningful change “in our backyards” - the positive opposite of NIMBY. ioby's platform gives everyone the ability to organize all kinds of capital—cash, social networks, in-kind donations, volunteer time, advocacy—from within the neighborhood to make the neighborhood a better place to live. Neighbour Grants is the Calgary Foundation’s original grassroots granting program, offering grants since 1999 with five cycles each year. The program has helped people do many different things, such as build a community garden at their local park, gather to celebrate the artistic talents of local youth, create a traffic-calming pavement painting in front of their school, engage their cultural community in creative ways to address community priorities, and develop a community plan to guide neighbourhood redevelopment. Created in 2013, NPP is a response to the opportunity and need created by the New York City Department of Transportation’s (DOT) Plaza Program. In partnership with community-based organizations, the DOT is building pedestrian plazas across the city. Once the DOT creates a plaza, the city contracts with the community-based partner to maintain and program it. NPP combines direct service with advocacy to assist those community-based organizations serving as plaza managers in high need areas. Neighborhood Connections offers small grants to groups of residents in Cleveland and East Cleveland to do projects that improve the quality of life in their communities. Grants range from $500 to $5,000. Grants are intended to spur small, grassroots community projects. Grants may be used for a wide variety of activities and projects, and groups are encouraged to think in new ways about what will work in their communities and with whom they might partner. They also fund the "Neighbor Up" network, encouraging knowledge sharing amongst grant recipients and community leaders. The Our Town grant program supports creative placemaking projects that help to transform communities into lively, beautiful, and resilient places with the arts at their core. This funding supports local efforts to enhance quality of life and opportunity for existing residents, increase creative activity, and create a distinct sense of place. Our Town offers support for projects in two areas, arts engagement, cultural planning, and design projects along with projects that build knowledge about creative placemaking. 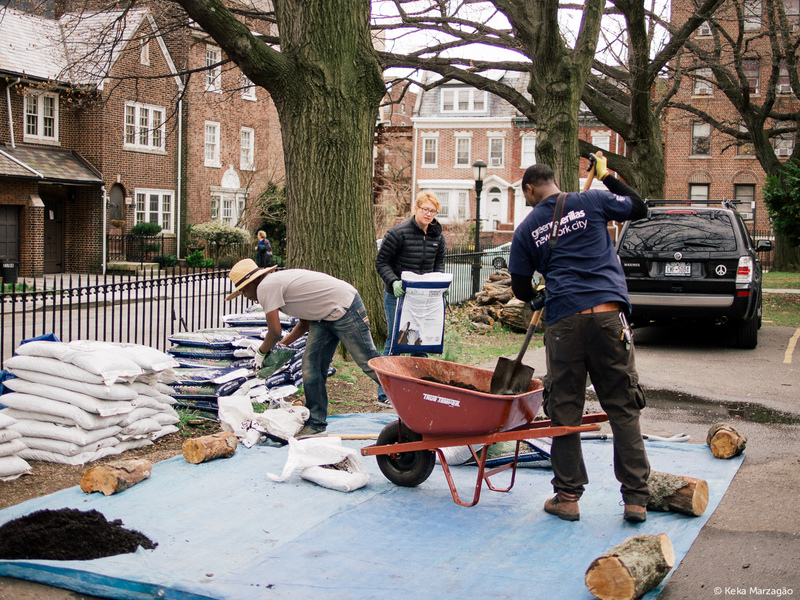 Through Neighborhood Grants, Citizens Committee awards micro-grants of up to $3,000 to resident-led groups to work on community and school projects throughout the city. They prioritize groups based in low income neighborhoods and Title I public schools. Recent awards have enabled neighbors to come together to make healthy food available in their communities, transform empty lots into community gardens, organize tenants to advocate for better housing conditions, and start school recycling drives. The deadline for this round of grants is January 25th, 2016.